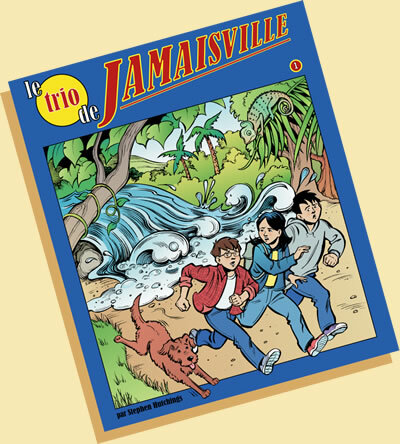 The french version, “Le trio de Jamaisville,” was designed to provide new and exciting reading material for french immersion students. Packed with colourful illustrations and action, the story is aimed at the Grade 4 and 5 levels, with a language level to match the narrative. All children benefit from extra curricular reading, and they take to it enthususiastically when they’re reading for pleasure. In that irresistible comic book form, here are some adventure stories that they can read in french, without feeling as though they’re doing their homework. The plot, characters and action should also capture the curiosity of native french speakers in the same age group. The text is in the exceptionally clear font, FS Me, which was designed to address reading disabilities, but also makes reading in a second language that much easier. The books can be read on iPads, Chromebooks, whiteboards and any other computers or tablets with an internet connection. The Story – In a new town at a new school, brother and sister Jamie and Kate are having trouble fitting in. After Matt, one of the school trouble-makers, finds Jamie’s secret lab in the school basement, a strange old telephone buzzes with a message for help- and the three embark on an exciting adventure into the distant past. As well as the adventure, young readers will enjoy the sometimes lively exchanges between Kate and Matt, and the clever way Jamie solves the mystery.